Have you ever thought about racing your RC? Not sure you have what it takes? Not sure how to get involved? 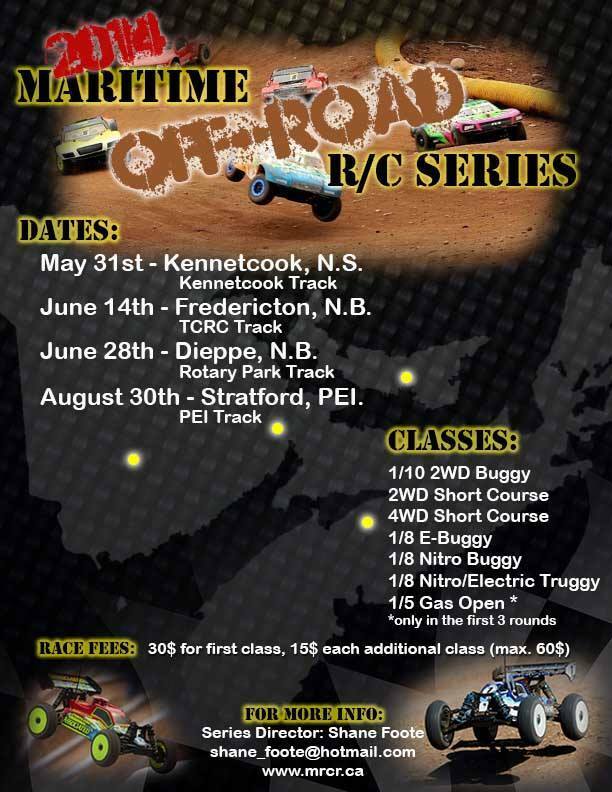 The 2014 Maritime Off-Road RC Series will soon be getting started and the doors are open to Racers of all experience levels. The 4 round series with tracks in N.B., P.E.I., and N.S. is open to everybody. They have many parent and child teams and an age demographic that ranges from about 10 years old to 60 years. Each race has trophies awarded and larger trophies for the Series Champions at the end of the season. They also have random door prizes from Sponsors. Not sure your RC is qualified? If you have a RC vehicle that fits into one of these classes then they have a spot for you. Not sure you have the time? It is 4 races over the summer. Not sure you can afford it? If you love RC’s and are interested in racing, if you are male or female, old or young, this is your chance to get your foot in the door and start trading paint. With the assistance of all the other competitors, you will be up to speed in no time. Who knows, you could be the next Ty Tessmann. If you already know how to wheel your rig around a track, then this is your chance to see if you have what it takes to become a Champion.